The most popular (and only?) beard retexture mod for Skyrim, Beards - from Hvergelmir's Aesthetic series is now available for Skyrim: Special Edition! 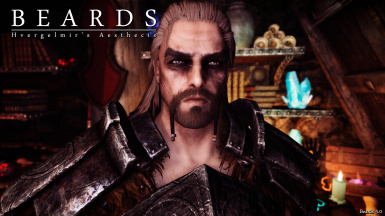 Geralt of Rivia Racemenu Preset from Witcher 3 for Skyrim SE optional. you can use whichever facial hairstyle you want. You do generally not need to ask me permission to use my Aesthetic's series assets in follower mods or mods that edit one or a few characters. As a rule of thumb, as long as you don't include all or most of the textures from one of my Aesthetic mods in your mod, you're good to go. If you do large character overhaul mods, I'd prefer if you made my mods a requirement instead. Thanks for understanding. 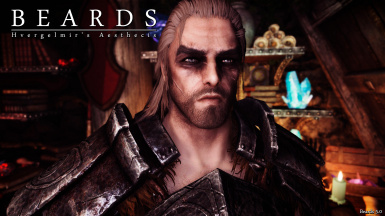 You may use Hvergelmir's Aesthetic mods assets for a mod of your own under these specific conditions; you must give proper credit. You must link back to the original mod page from yours, with a CLEAR visible link, you must not release your mod(s) with my mod assets outside of Nexus PERIOD. My mods may not under any circumstances be distributed any other place than Nexusmods - I also upload my mods to Bethesda.net - do not ask permission to port my mods to Bethesda.net or Steam, the answer is no. If in doubt, refer to the mirrors list, if a site is featured there it has my permission to distribute my mod(s). All textures in this file has been hand painted by myself. Beards for legacy Skyrim was featured on G.E.M.S. 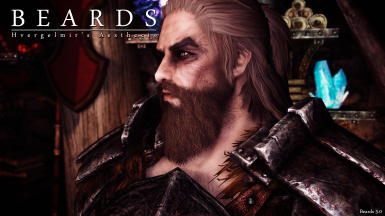 Beards is without a doubt a fundamental and required texture mod for Skyrim and is one of Hvergelmr's most popular mods ever with nearly 1,5 million downloads and roughly 600,000 unique download for legacy Skyrim. If you didn't use Beards for Skyrim, you're either a peasant or have lived under a rock until now. Brows is available for both legacy Skyrim, Special Edition and Skyrim on Xbox One. But you already know Beards and what it's all about, so hurry up and go download! Beards is part of Hvergelmir's Aesthetics series, a mod series that aim to replace all of vanilla Skyrims character generation textures, including (and not limited to) eyebrows, hair, eyes, beards, tint masks (war paint), scars and detail maps. This was always the plan, and slowly, but surely I'm creeping towards that end goal. Beards replace all of vanilla Skyrim beard textures (including the Khajiit "beards"), with completely new high resolution, hand painted (from scratch), textures. This is done to provide the best photo realistic look possible. The aim is to stay true to the original look of the vanilla textures, but providing a more natural and realistic look. The original vanilla textures unfortunately suffered from the low resolution and quality and it made having a beard in game very unappealing. Beards also include an optional (but highly recommended) .esp file that enables a selection of previously unavailable Bethesda beards. 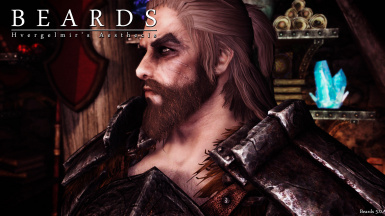 These beard styles, featuring mostly a selection of braided beard styles were probably omitted from the game because of a release schedule and where unfortunately never completely finished (and fixed) for character customization. Some looks fairly usable, but with some skill and finesse using RaceMenu, it IS possible using the sculpt tool to even out and fix these beard styles. I might provide a video tutorial on that later, if demand is high. Just keep in mind that I didn't model the beard styles, they were made by Bethesda, so don't pester me about fixing them. One thing is certain about Beards, even if you don't play male character it'll make all bearded NPCs look much better, and more realistic, so there's absolutely NO excuse NOT to use Beards! Vanilla beard textures are 256² (512² for SSE and High Resolution Texture pack). Beards Ultra pack comes at 4096 and are mostly targeted towards screen archery. Beards High pack comes at 2048 and is recommended for the average modern rig. Then there's the Low pack at 1024 (with 2k normals) and is recommended for lower end PCs. You can probably barely see the difference between all variants unless you zoom in very close. Add more beard styles - made from scratch. Potentially add HDT physics to said new beard styles - I still need to learn. 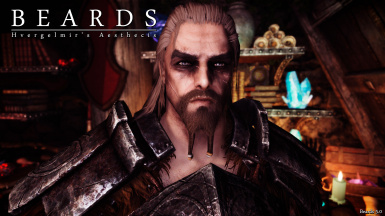 Maybe fix the vanilla braided/beaded beard styles. Very low priority. It is recommended to install Beards with Vortex Mod Manager, it simplifies the process greatly and also makes it simple to deactivate or uninstall again if needed. Beards now come in a Fomod installer to make installation even easier. If asked to override, click yes. Please keep in mind this will override any other beard (re)textures you currently have installed. Please keep in mind this will delete any other beard (re)textures you currently have installed. If you know what you're doing you can enter the beard folder and delete each texture manually as you see fit.